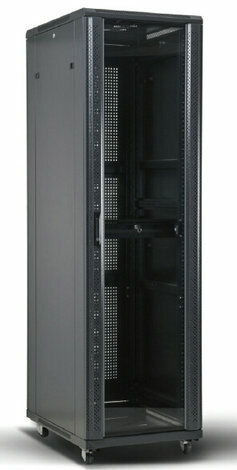 Standard racks 42U & 47U, mainly used in computer room of finance, securities, data centers, specifically designed for servers, providing a good- performance and stable working environment for equipments inside. It has been widely adapted by professional server vendors such as IBM.SUN.HP.COMPAQ.CELL. Strict degreasing, pickling, rust, phosphating, cleaning with pure water, and then powder coating, coating thickness: 80μm—100μm, conform to the ROHS requirement. With easily removed perforated curved front door, double -opened rear door, and both side doors split into 2parts, which can be opened separately and independently. Ventilation rate is above 80% to facilitate ventilation and cooling. Several adjustable cable routing channels on the top and bottom, both sides of rear panel are with multifunctional cable management, routing hole at the bottom. Caster wheels and supporting feet can be installed at the same time, the maximum static loading is 1000 kgs.